A list of reports, articles, or published letters about performance information and how it is reported by public entities. February 2019: Recent changes to the Education Act 1989 require tertiary education institutes' statement of service performance (SSP) for 2019 to comply with generally accepted accounting practice. In this letter we discuss the upcoming changes to SSP requirements for tertiary education institutes' annual reports, provide some guidance on performance reporting, and recommend next steps for further information and support. June 2012: In this paper, we discuss characteristics of annual reports that we consider are necessary for good accountability. Local government: Results of the 2008/09 audits. 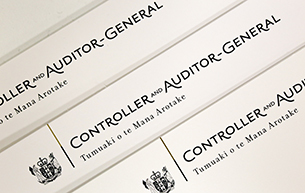 Central government: Results of the 2008/09 audits. What is the state of public sector reporting, and what is it saying about public sector management? July 2009: Auditor-General Kevin Brady's address to the managing and measuring performance seminar on 20 July 2009. Forecasting and reporting performance: The search for the Holy Grail? February 2008, speech made by Kevin Brady, Auditor-General, at the After the Reforms Conference in Wellington. Paper by Ann Neale and Lyn Daken, May 2000. Paper by Ann Neale & Bruce Anderson, March 2000.